Belvedere Polish Plain Rye Vodka is a popular Vodka available from DrinkSupermarket.com in 70cl to buy online. 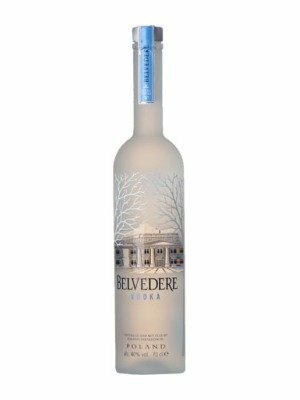 Visit DrinkSupermarket.com for the best price for 70cl of Belvedere Polish Plain Rye Vodka or compare prices on our other Vodka products. Pinnacle of the Polish vodka-making distilled completely from the finest rye and refined four times to create the perfect balance of character and purity. Additive free and diluted with water from Belvedere's own artesian well, this is a vodka that combines over 600 years of vodka producing expertise. You can buy Belvedere Polish Plain Rye Vodka online in most retailers and find it in the Vodka aisle in supermarkets but we found the best deals online for Belvedere Polish Plain Rye Vodka in DrinkSupermarket.com, TheDrinkShop, Tesco Groceries, Waitrose Cellar, and others. Compare the current price of Belvedere Polish Plain Rye Vodka in 70cl size in the table of offers below. Simply click on the button to order Belvedere Polish Plain Rye Vodka online now.